A full Hybrid solution. 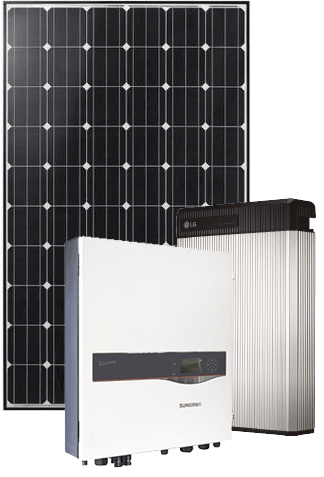 Offering Leading LG Panels with a Sungrow Hybrid ready inverter & the LH Chem Lithium battery storage, this is your complete battery solution available today. With great low light and excellent high temperature performance, double sided cell technology, and 12 wire busbars, the LG Panel is designed to harvest every ray of sunshine and convert it into electricity. A top performing panel for high quality solar solutions. Much like the REC they offer more power per panel per square metre on your roof. Very popular for customers with limited roof space. Sungrow Inverters offer a standard Grid Connect inverter and a Hybrid ready inverter that houses chargers ready for battery connection. Optional WiFi with built in consumption monitoring allows you to track system performance, homes usage, and battery consumption. Optional Emergency power supply available which gives customers the opportunity to run certain appliances in the unlikely event of a black out.